Hey, this is my first post on Eurobricks so if there is anything that I am doing incorrectly in this post, please let me know. I am presenting my Rock Crawler, or more specifically, my Carrot Crawler. -Triangulated 4-link suspension using the Lego soft shock absorbers. -One PF XL motor per axle (a total of two), each geared down 1:2.779. -Custom portal hubs for each wheel. -Ackerman Steering with slight caster angle powered by PF M motor geared down 1:3.333 including a worm gear. -Rechargeable LiPo battery box as power source. -Controlled by a SBrick and an iPhone 6. -RC4WD 1.9" Super Swamper crawler tires. This has been a work in progress for a long time and I feel that it is finally polished enough to showcase on the Eurobricks community. -Eliminate gear slippage caused by the perpendicular bevel gears. -Mount the XL motors parallel to the axles which would both eliminate gear slippage and provide more ground clearance. Please give my any suggestions for my post and more importantly, my crawler! 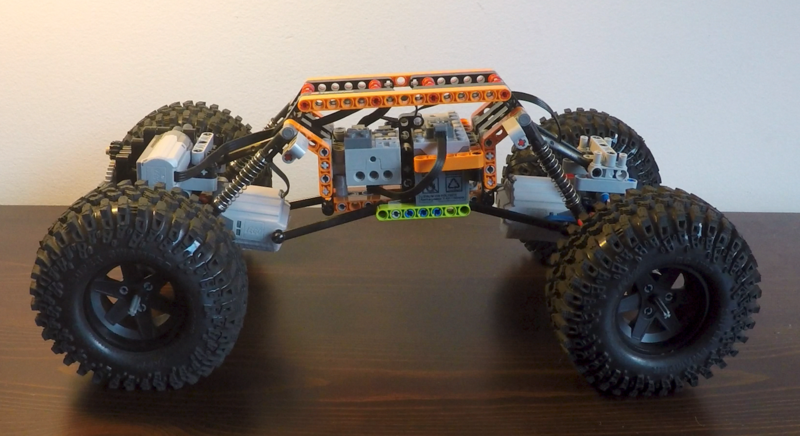 Your crawler chassis looks like a great start to the lego RC world. You should put some kind of body on top of it. You can even borrow someone else's body design and adapt it to your chassis. Ensure the structure encasing the gears is rigid. Place the pinion gear in double shear like the GM 14 bolt with its pinion support. 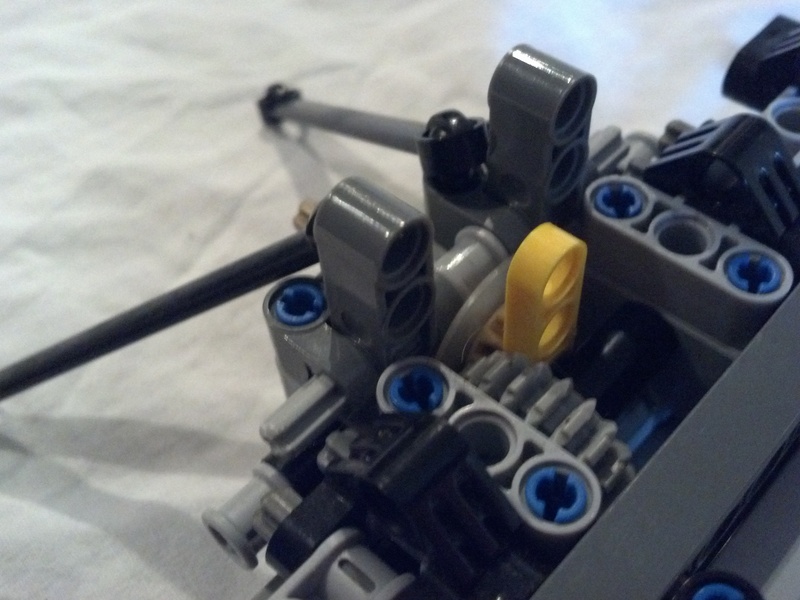 Use a non-lego shim behind the pinion gear to prevent deflection. Here is a pic of the a shim and the pinion support in the axle of my latest crawler. Oh so is the pinion support the yellow piece in front of the gear? Is it secured to the chassis? And is the shim behind the gear a lego piece? If so, what piece? Which sets do those wheels come in or at least what size are they? 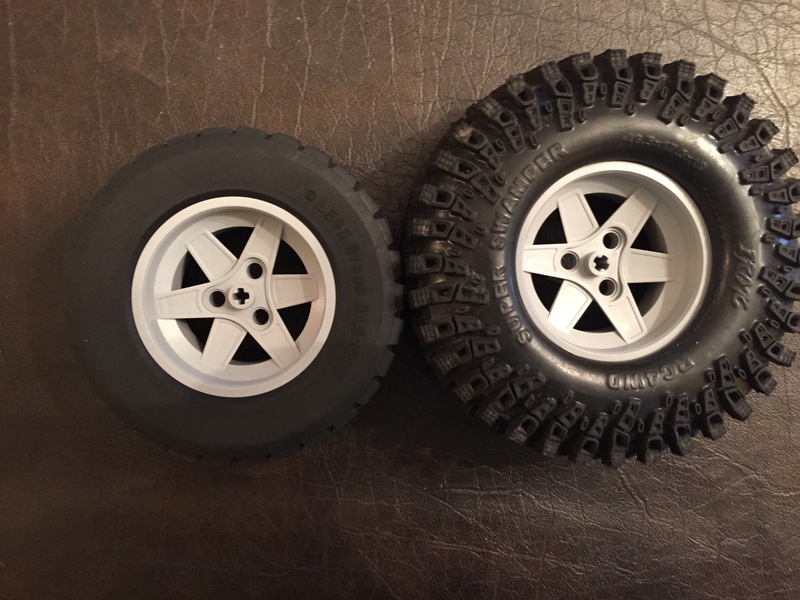 The tires are not Lego but are rather from here:http://store.rc4wd.com/Interco-IROK-19-Scale-Tire_p_1423.html. The rims, however, come in many sets and I got mine from the Technic 8110 Unimog. Very cool dude the crawling performance seems quite good and I see you intend to make it better, I suggest making a low simple body from beams to make it look like a really crawler, with out adding to much weight. Yes. the yellow piece is a 5l thin lift arm that is anchored at the bottom and the top of the axle. The 'snout' of the pinion seats into the center hole. The nylon washer/shim is not a lego piece. It came from McMaster Car, but I don't have a part number. I am very impressed ! Can you give us the size of the wheels and of the crawler ? Can it climb stairs from face and how high the step ? But what exactly do you mean by using beams for a low simple body? Could you give me an example?